Source of title proper: Title based on provided annotation. 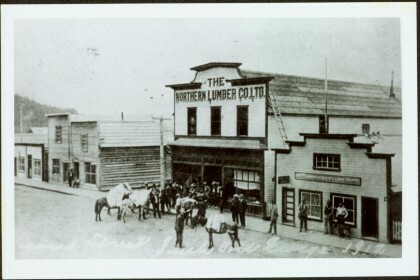 Photograph depicts crowd and horses gathered in front of street building with the sign "The Northern Lumber Co Ltd."
Handwritten annotation on verso “Second St., South Fort George, 1912". Item is part of the Prince George Historical Photograph Collection. Handwritten annotation on verso of photograph: "13".